Click to enlarge. Source: Climate.gov. Cutting greenhouse gas emissions down to zero is not enough. Any Green New Deal needs a disaster relief component, because climate change is already bringing floods, fires and other emergencies. The United States needs a Disaster Response Corps, organized along the lines of the original New Deal’s Civilian Conservation Corps, to deal with climate emergencies. Like the CCC, it also would be a jobs program. Right now disaster response is the responsibility of state and local governments, and non-profit organizations. The federal government’s role is limited to coordination and providing financial aid. Commonly volunteer groups, such as the Cajun Navy or Occupy Sandy, have to step in when organized relief efforts fail. 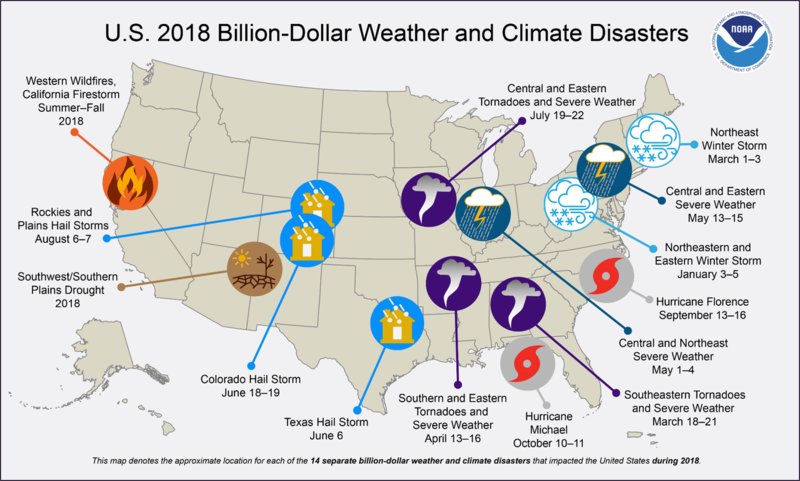 The outlook is for more and worse climate- and weather-related disasters. It won’t be just fires and floods. As droughts become worse, we can expect internal climate refugees, like the “okies” who were driven off the land during the Dust Bowl disaster in the 1930s. My idea is that virtually anyone would be able to enlist in the Disaster Relief Corps for a fixed amount of time. Enlistees would agree to accept military-type discipline and go where they’re sent. The time between emergencies would be spent in training or maybe taking on some of the tasks of the 1930s CCC..
Pay would be comparable, in inflation-adjusted terms, to what CCC workers or enlisted soldiers got in the 1930s. Enlistees could be discharged for misconduct, neglect of duty or refusal to follow orders. The Corps’ mission should not be assigned to the military. The military is for warriors; the Corps would be for rescuers. It would be tricky to set it up in a way that didn’t undermine existing efforts, programs and volunteer efforts, but I think it could be done. Maybe in time the U.S. could help fund a United Nations International Disaster Relief Corps. There would be plenty of work for it to do. Climate change is already upon us. Cutting back in greenhouse gasses will limit how much worse it gets, but that won’t make it go away. We have to deal with what’s already happening. U.S. Disaster Relief at Home and Abroad by Rocio Cara Labrador for the Council on Foreign Relations. 34 Disaster Relief Organizations, a list by Raptim Humanitarian Travel. They’re doing good work. But should they be expected to do it all? Lambert Strether of Naked Capitalism wrote two good posts about how the floods in the Midwest reflect not only a changing climate, but a failure of government to maintain and improve flood control systems. After disastrous floods in 1936, Congress authorized a construction program of dams, and channels to prevent a recurrence. These dams and levees have not been maintained, with disastrous results. One was a breach of the levees around New Orleans after Hurricane Katrina. Strether cited similar failures of infrastructure in the Midwest now. In the 1930s, we Americans were capable of national efforts that served the common good. Now we don’t seem to be able to maintain what we have, even when obviously necessary. As Strether noted, a 21st century flood control program would be less about dams, levees and channels and more about protecting wetlands and moving development back from flood plains, so that flood waters can be soaked him instead of directed elsewhere. But the principle is the same. The nation needs to come together again. ‘Breaking Everywhere’: Flooding Bursts Midwest Levees and Tough Questions Follow by Mitch Smith and John Schwartz for the New York Times. The New Deal, the Green New Deal and Flood Control by Lambert Strether for Naked Capitalism. More on Flood Control: The Missouri River, the Levees and the Gavins Point and Spencer Dams by Lambert Strether for Naked Capitalism. We Americans have actually done quite a bit to cut back on greenhouse gas emission, as the chart above shows. But while we and the other North Atlantic nations have been cutting back, China and other nations have been pumping out more. The average Chinese doesn’t add all that much to global warming, compared to the average American. But there are so many more Chinese than Americans that China as a nation does more heat up the world more than the USA does. Click to enlarge. Source: The Conversation. The problem is that, for now, the economic growth of China, India and the Global South in general requires more use of coal, oil and natural gas. If I were Chinese or Indian, I would be unwilling to give up my hope of a better material standard of living while Americans and Europeans have so much more than I do and individually leave so larger a carbon footprint than I do. ADDED 3/24/2019. I MADE A BIG MISTAKE HERE. THIS IS THE DRAFT PROPOSAL BY ALEXANDRIA OCASIO-CORTEZ, NOT THE VERSION THAT WAS ACTUALLY INTRODUCED. The Green New Deal resolution introduced by Rep. Alexandria Ocasio-Cortez and Senator Ed Markey proposes to address a climate change crisis and a social-economic crisis. Here’s a quick summary of what they specifically propose. Repair and upgrade U.S. infrastructure, including ensuring universal access to clean water. Work with farmers and ranchers to create a sustainable, pollution and greenhouse gas-free, food system that ensures universal access to healthy food and expands independent family farming. Totally overhaul transportation by massively expanding electric vehicle manufacturing, build charging stations everywhere, build high-speed rail at a scale where air travel stops becomes unnecessary and create affordable public transit available to all, with the goal of replacing every combustion-engine vehicle. Make the US the leader in addressing climate change and share our technology, expertise and products with the rest of the world to bring about a global Green New Deal. “It is worse, much worse than you think.” So begins David Wallace-Wells’ THE UNINHABITABLE EARTH: Life After Warming (2019), one of the most important books I’ve read in years. It is not proof that global warming is taking place, and it is not a plan to mitigate or reduce global warming. It is simply a compilation of all the ways that climate change is disrupting the world we live in, and what may happen if nothing is done. The best-case scenario is a future like the present, only more so—more storms, more droughts, more floods, more wildfires, more tidal waves, more heat waves, but with the basic social order remaining intact. The worst-case scenario, which can’t be ruled out, is that most or all of the earth’s surface becomes unfit for human habitation. 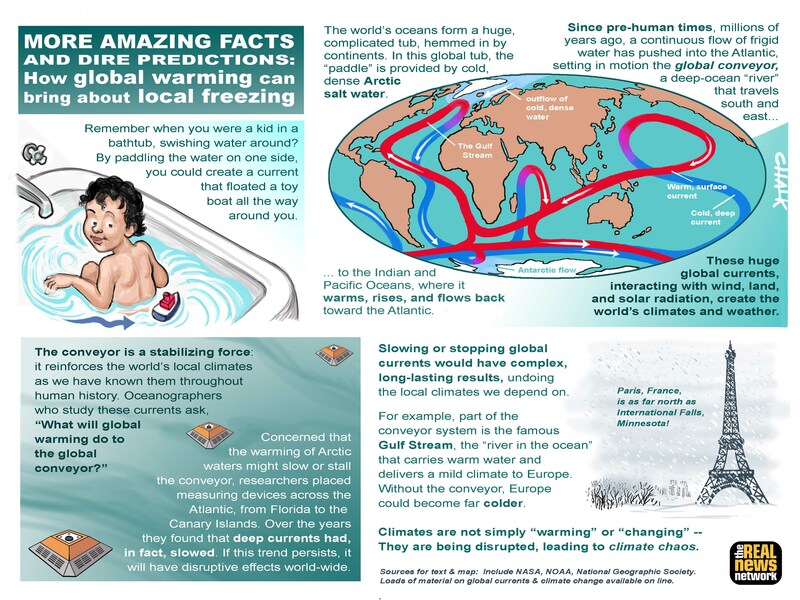 When I first heard about global warming, I wondered whether it was real. I didn’t see how it was possible to measure average temperatures over the whole Earth to within a degree or so, or rise in average sea levels within inches. Actually, I still don’t. Still, I thought, the possibility of global warming provides one more reason for doing a lot of things that are desirable in themselves—reducing air and water pollution, switching from fossil fuels to renewable energy. 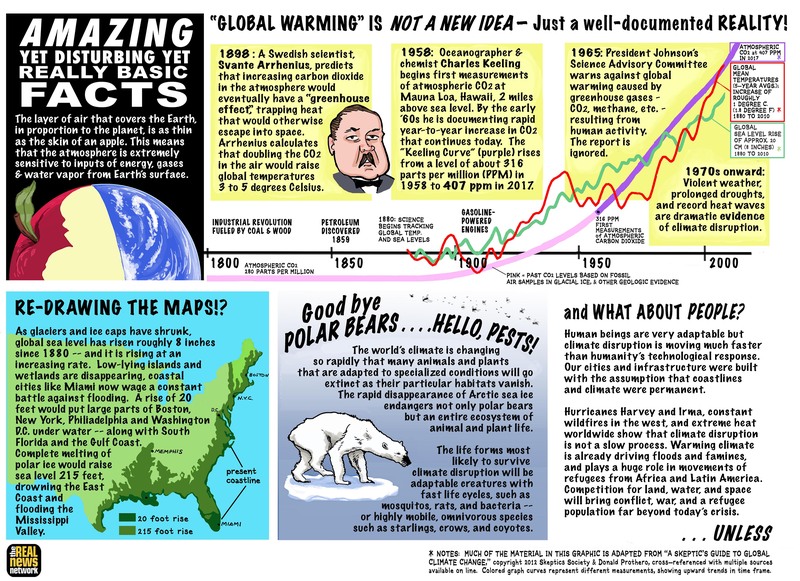 Over the years I came to the realization that since the greenhouse effect was scientific fact, and since greenhouse gasses were being emitted into the air at an ever-increasing rate, there was bound to be a crisis sooner or later. That crisis is now upon us. Fourteen of the world’s 20 largest cities have experienced water shortages or drought. Cape Town, South Africa, nearly ran out of water. Freshwater lakes from Lake Mead to Lake Chad are drying up. The number of major floods have quadrupled since 1980 and doubled since 2004. Australia’s Great Barrier Reef is dying because of the warming ocean. The melting of the Arctic ice cap has changed wind patterns in China in ways that caused life-threatening smog in major cities. 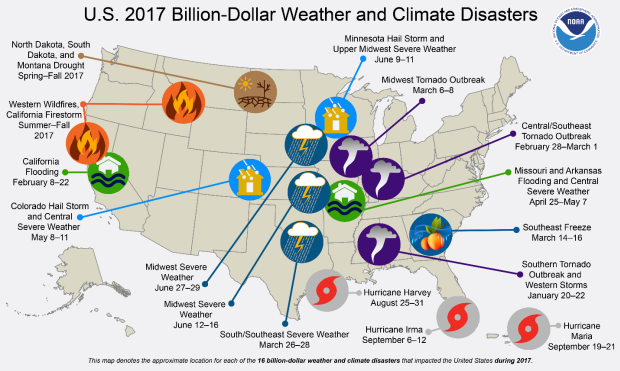 The summer of 2017, in the Northern Hemisphere, brought unprecedented extreme weather: three major hurricanes arriving in quick succession in the Atlantic; the epic “500,000-year” rainfall of Hurricane Harvey, dropping on Houston a million gallons of water for every single person in the entire state of Texas; the wildfires of California, nine thousand of them burning through more than a million acres, and those in icy Greenland ten times bigger than those in 2014; the floods of South Asia, clearing 45 million from their homes. Then the record- breaking summer of 2018 made 2017 seem positively idyllic. It brought an unheard-of global heat wave, with temperatures killing 108 in Los Angeles, 122 in Pakistan and 124 in Algeria. In the world’s oceans, six hurricanes and tropical storms appeared on the radars at once, including one, Typhoon Mangkhut, that hit the Philippines and then Hong Kong, killing nearly a hundred and wreaking a billion dollars in damages, and another, Hurricane Florence, which more than doubled the average annual rainfall in North Carolina, killing more than 50 and inflicting $17 billion worth of damage. There were wildfires in Sweden, all the way to the Arctic Circle, and across so much of the American West that half the continent was fighting through smoke, those fires ultimately burning close to 1.5 million acres. Parts of Yosemite National Park were closed, as were parts of Glacier National Park in Montana, where temperatures also topped 100. In 1850, the area had 150 glaciers; today, all but 26 are melted. The years to come will not be better. One key fact about the greenhouse effect is that it is additive. Nothing that is done to reduce greenhouse gasses in the future will remove the greenhouse gasses now in the atmosphere, at least not in the lifetime of any living person or their future children. Another is that annual greenhouse gas emissions are still increasing. Half of the emissions that occurred since the start of the industrial revolution took place in the last 30 years. We can’t predict how successful the world’s nations will be in cutting back on fossil fuels and other sources of greenhouse gasses. We can’t predict the exact impact of these gasses. All we know for sure is that every addition to the world’s greenhouse gasses makes this worse. And everything that is done to stop additional greenhouse gasses prevents things from being worse than they otherwise would be. 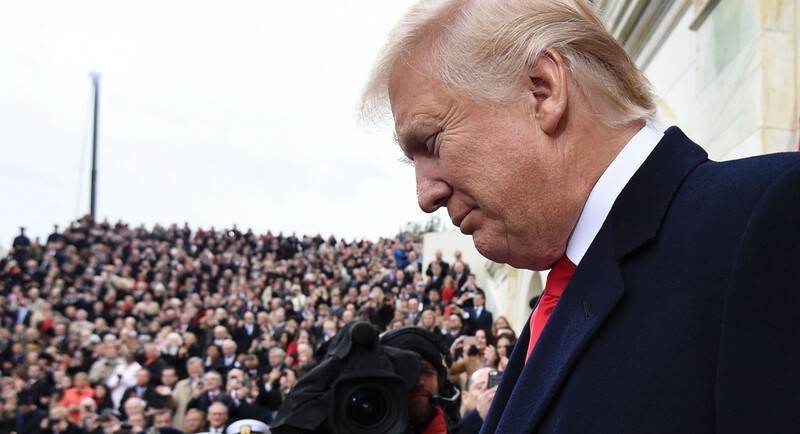 Most of the coverage of President Donald Trump is based on his constant stream of tweets and social media comments, which enables him to dominate the news. Most of the rest is based in developments of the Mueller Russiagate investigation, which may or may not turn out to be what it’s cracked up to be. What’s out of the spotlight is reporting about the Trump administration’s actual deeds and policies. Trump has continued American policy to risk nuclear confrontation with Russia and North Korea, which puts the whole world in danger. The national security establishment has undermined his feeble and inept attempts to make peace. But evidently he has frightened the North and South Korean governments into trying to make peace among themselves, which is a good thing. Trump does not even pay lip service to trying to avert catastrophic global warming. Instead his policy is to promote fossil fuels over renewable energy, which will speed up climate change. Nuclear war and global warming are the main existential threats to the nation and the world. Trump has failed to address the first and is actively preventing action against the second. Trump during the campaign promised to do something about the offshoring of American jobs, which is a real problem that the other candidates ignored. But his threats and tariffs will not help because U.S. industry has become too entangled in international supply chains to free itself overnight. What’s needed is a long-range industrial policy that will rebuild American industry, which neither party has so far attempted. Trump during the campaign promised to reform immigration, which is another real issue other candidates ignored. The cruel treatment of asylum seekers and long-time foreign residents is shameful and does not change the overall situation. I think there is something to be said for a merit-based immigration system, but I admit I don’t have a complete answer to the immigration question. But neither does Trump. Climate change is real. It’s happening. Here are some short refreshers on the basic facts. How long can they put their heads in the sand? How long can members of the Trump administration ignore the reality of climate change? In the opening of Kim Stanley Robinson’s new SF novel, New York 2140, two unemployed financial software engineers known as Mutt and Jeff—unemployed because they refuse to design a possibly illegal program for high-speed trading—contemplate a flooded lower Manhattan from atop the former Metropolitan Life building. One of them says he has figured out what’s wrong with capitalism. The basic problem with capitalism, he says, is that the forces of the market forces producers to sell products below cost. How can you sell below cost and survive? By offloading your costs onto someone else—onto customers, onto neighbors, onto taxpayers, onto the wider community and onto future generations. This enables an individual enterprise to survive (sometimes), but, in the long run, leads human society into bankruptcy. 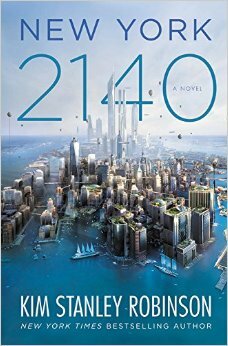 In the novel, global warming has taken place, sea levels have risen and lower Manhattan is under water. Skyscrapers such as the Met Life building are still survive amid a kind of new Venice. Uptown Manhattan is 50 feet higher in elevation, and is dry. In the middle is a tidal zone, where the poor and homeless congregate. Some environmental problems have been solved, or at least are being coped with. Gasoline, jet fuel and other fossil fuels no longer exist. Air travel is by dirigible, ocean travel is by sailing ship and land vehicles are electric. But the financial structure and distribution of income are more or less like they are now. New skyscrapers—”superscrapers”—in uptown are owned by the world’s wealthy elite, as investments or as one of multiple homes, and are often vacant. A hurricane late in the novel leaves many homeless. They try to storm the vacant uptown towers, and are turned back by private security forces, who outgun the New York Police Department. Rather than attempt a violent revolutionary overthrow, the common people attempt a political and economic jujitsu. They join in a nationwide debt strike. On a given day, they stop paying their mortgages, student loans and credit card balances. The financial system is go highly leveraged with debt upon debt that it comes crashing down, just as in 2008. So the financiers go to Washington for another bailout, just as they did then. But this time, the President and Federal Reserve Chairman, who are in on the plan, act differently. They tell the banks and investment companies that they would be bailed out only on one condition—that the government be given stock of equal value to the bailout, as was done in the bailout of General Motors. Those who refuse this deal are allowed to fail. Now the federal government has the authority to force the banks to act as public utilities. And the huge profits that once flowed to the financial elite now flow to Washington, which makes it possible to adequately fund public education, infrastructure improvement, scientific research and all the other things the country needs. And so the American people live happily—not ever after and not completely, but for a while. Emissions of carbon dioxide and other greenhouse gasses remained level during the administration of George W. Bush and actually fell during the administration of Barack Obama, even though economic output rose. This means that economic growth doesn’t depend on making global warming worse. It means that, to the contrary, it is feasible to do something about global climate change. It won’t mean that the Greenland ice cap will stop melting or the American Southwest will stop suffering from drought or coastal cities such as Miami or Houston will be safe. It took a long time to create the buildup of greenhouse gasses in the atmosphere, and it will be a long time before they go away. The benefit of reducing greenhouse gasses will go to future generations, not to us. But is good news, just the same. Part of this is due to technological progress, which has made renewal energy competitive (or more nearly competitive) with fossil fuels. But credit also is due to the actions of the Environmental Protection Agency and the Department of Energy under President Bush and especially President Obama. Sadly, this may all change for the worse under President Donald Trump, who denies the reality of human-made climate change and is filling his administration with climate change deniers. The temperature of the Arctic is 50 degrees warmer than usual—so warm that it is off the chart for this map. A warming Arctic in some ways is a good thing. It frees up the Arctic Ocean for navigation and (which may or may not be a good thing) opens up the oil and mineral resources of the Arctic for exploitation. But it disrupts the weather patterns throughout the whole Northern Hemisphere. A melting Arctic ice cap changes ocean currents and a melting Greenland glacier raises the levels of the sea. Meanwhile 2016 is on track to replace 2015 as the hottest year on record worldwide. Stopping greenhouse gasses immediately would not reverse global warming within the lifetime of anyone now alive. They will affect the world’s atmosphere for a long time to come. The choice for the world’s policymakers is whether and how much to stop making things worse. The choice for us, the citizens of free countries, is how much we care about those who will come after us. Click on this for a larger version of the map. Donald Trump, along with many other Americans, is reluctant to admit refugees from foreign wars. In Europe, there’s a backlash against admitting refugees. Of course there might be fewer refugees if the United States and other governments hadn’t destroyed or tried to destroy functioning governments in Iraq, Libya and Syria. A decade ago, Syria was a country that took in refugees, not a country from which refugees fled. But within the next 10 years or so, the number of war refugees might be overtaken by the number of climate refugees—families fleeing drought, floods and hurricanes caused by global warming. Think of the people fleeing New Orleans after Hurricane Katrina, or people fleeing the Dust Bowl region in the 1980s. Think of the crisis in Germany over hundreds of thousands of refugees from Syria, Iraq and other war-torn countries in the Middle East. Now imagine this on a global scale and magnified 10-fold or 100-fold. Most of the world’s governments, including the USA and China, have been slow to respond to the need to slow down climate change. But President-elect Donald Trump is committed to policies that will actively make things worse! Unless something important changes, a global climate refugee crisis is inevitable. I can’t predict when the climate refugee crisis will hit—whether during the Trump administration or later. I can predict that when it does, the United States will be the world’s scapegoat for everything bad that happens. We Americans will deserve the blame for a lot of it. We will get the blame for all of it. Southern Louisiana, like the Netherlands, is inhabitable because of the actions of humankind. Just as the Dutch live behind their ocean dikes, Louisianans live behind their river levees. Inadequate maintenance of the levees by the U.S. Army Corps of Engineers made the Hurricane Katrina disaster of 2005 worse than it might have been. There is a problem with the levees. Southern Louisiana is part of the Mississippi River delta, built up of topsoil from a huge drainage area stretching from the Appalachians to the Rockies. The wandering course of the Mississippi deposited this soil over a wide area. With the levees, the Mississippi is confined to a narrow channel. This prevents floods, but also prevents replenishment of the delta. As a result, much of southern Louisiana, including New Orleans, is slowly sinking, creating a need for even higher levees. There is a good side to this. Sinking replaces dry land with swamps and wetlands. Although swamps and wetlands are not walkable or inhabitable, they provide a buffer against ocean flooding by absorbing the water. It’s complicated. Global climate change will generate more floods, and make things even more complicated. Louisiana Loses Its Boot by Brett Carrington for Medium. The source and explanation of the top map. Also a good explanation of the need for accurate maps. Taming the Floods, Dutch-style by Damien Carrington for The Guardian. Obama has sufficient scientific resources at his command to know exactly what we are doing and failing to do. He came into office with control of both houses of Congress and a clear mandate to act on the climate crisis, with scientists the world over sounding all the necessary alarms. But in pursuing an “all-of-the-above” energy policy, highlighted by the figurative explosion of fracking and the literal explosions of oil trains and deep sea drilling rigs, Obama has turned the US into the No. 1 producer of fossil fuels in the world. True, Obama’s Environmental Protection Agency has enacted regulations classifying greenhouse gasses as pollutants, which are intended to close down aging coal-fired electric power plants. He has obtained subsidies to promote renewable energy. And he has set targets for reducing greenhouse gas emissions, to be accomplished by future administrations. But this has been offset by his promotion of the domestic oil and gas industry and his opposition to enforceable international climate treaties. The problem is that there is no immediate political payoff from trying to slow down global warming. The climate change that is manifesting itself right now—record-breaking temperatures, floods and droughts—is the result of decisions made or not made 30 or 40 years ago. What is done—or not done—today about climate change will not change the present situation. It will only help people 30 or 40 years from now. There is little political incentive to do that. Neither democratic government nor free-enterprise economic systems, assuming that this is what we have, would respond to the immediate concerns and wishes of the public, but not to warnings about future problems. Not that socialist dictatorships have a better record! The only answer, as I see it, is for climate change activists to do what Naomi Klein describes in her book, This Changes Everything, which is to join up with those who are fighting fossil fuel companies on other grounds—protection of property rights, Indian treaties, public health and the environment, and the authority of local government. 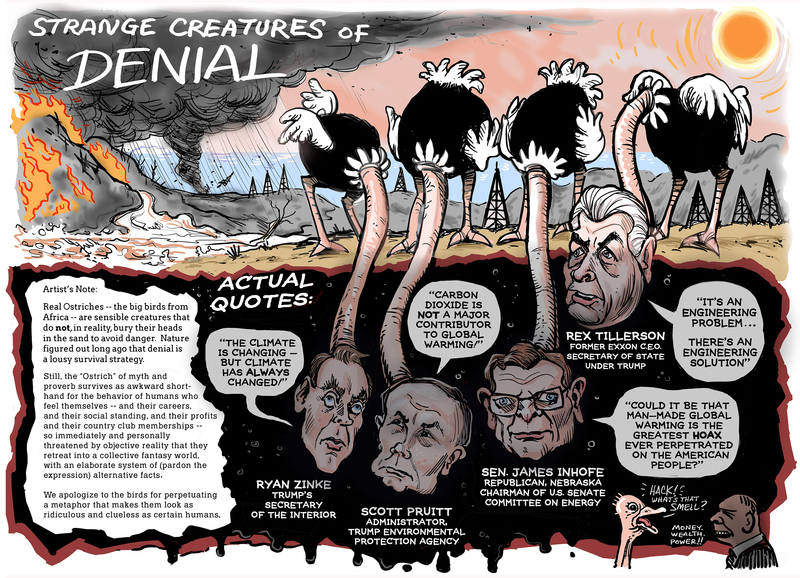 President Obama’s Lethal Climate Legacy by Zhiwa Woodbury for Truthout. Will the Arctic be the next big arena of conflict? 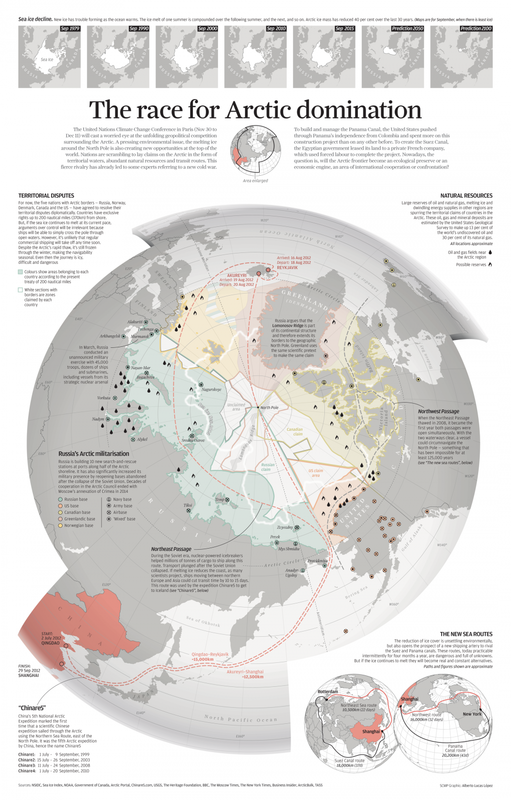 The warming Arctic is likely to be a new arena of conflict between Russia and the USA. But unlike in current conflicts in Ukraine and Syria, there will be no question of democracy or a fight against terrorism to cloud the central issue—control of oil and gas resources and transportation routes. The infrographic by the South China Morning Post provides a good snapshot of the situation. The potential conflict in the Arctic is even more dangerous than existing conflicts, because of its potential for direct confrontation between the USA and Russia. The other nations with the greatest physical presence in the Arctic are Canada and Denmark (which controls Greenland). It will be interesting to see whether they will follow the lead of the United States or try to steer an independent course. The irony of the situation is that the Arctic is being opened up by global warming, which causes the Arctic ice cap to shrink over time, and that the warming is caused mainly by burning of fossil fuels, but the new oil and gas supplied from the Arctic will make it easier and cheaper to keep on burning fossil fuels. The best outcome would be for the Arctic powers to agree on sharing and conserving the region’s resources. That doesn’t seem likely anytime soon.